We are advised to well consider the specific audience and context of the words of the Master to better understand those words. The audience of these words is the Apostles. And on the way to Jerusalem where they are about to witness the murder of Jesus and be immediately subjected to capture, torture, and death. This is a grave time of great risk and none of them are truly prepared for the horror they are about to witness. Jesus is trying to prepare them for the very end of his and perhaps their own life. This is the context, the time, and the audience for these words...not us. To believers we are told the yoke is light and that the personal religious experience should presume salvation and eternal life as do the spirits tell us by faith and truth affirmations (103:9.5). We are also told that doubt/fear is our biggest obstacle to sublime peace and confident expectations of Paradise. Believers are NOT told to forsake family, home, community, career, or any other form of social position. Your lack of understanding and false and misleading interpretation is most unfortunate SEla/Stephen. And it is not me or my words who/which "stick with the positive side" except as I echo and quote the positive affirmations of reality in God's friendly universe as told us in the UB!!! Last edited by fanofVan on Thu Jan 10, 2019 11:28 am +0000, edited 5 times in total. Yes, and elsewhere in the book (I cannot recall the exact quote) it says something about how we are not expected to give up everything and pursue an exclusively spiritual existence; but that it is important and necessary that we conduct our material affairs, family relationships, and vocation. Yes...I recall 4 distinctions: Apostle; Messenger (the Seventy); Disciple; Believer and only Messengers and Apostles were required to forsake family and community for service...but not for their spiritual standing or progress!! 163:2.2 (1801.5) One earnest disciple came to Jesus, saying: “Master, I would be one of your new apostles, but my father is very old and near death; could I be permitted to return home to bury him?” To this man Jesus said: “My son, the foxes have holes, and the birds of heaven have nests, but the Son of Man has nowhere to lay his head. You are a faithful disciple, and you can remain such while you return home to minister to your loved ones, but not so with my gospel messengers. They have forsaken all to follow me and proclaim the kingdom. If you would be an ordained teacher, you must let others bury the dead while you go forth to publish the good news.” And this man went away in great disappointment. 155:6.11 (1732.4) Never forget there is only one adventure which is more satisfying and thrilling than the attempt to discover the will of the living God, and that is the supreme experience of honestly trying to do that divine will. And fail not to remember that the will of God can be done in any earthly occupation. Some callings are not holy and others secular. All things are sacred in the lives of those who are spirit led; that is, subordinated to truth, ennobled by love, dominated by mercy, and restrained by fairness—justice. The spirit which my Father and I shall send into the world is not only the Spirit of Truth but also the spirit of idealistic beauty. PS: apologies to those using phones -- can those with larger screens see the picture below? So...if metaphysics is mortal mind's attempt to explain and understand that reality which is not factually and scientifically known....a formation of speculations or inventions which helps the reasoning mind to construct a perception of reality and assist in the formulation of a working philosophy which unites the observable universe to the causes and forces or origins of creation and thought and self and spirit, and if reason, logic, and the cosmic intuitions delivers reality-response and insight to deep thinking to deliver a factual understanding of reality, especially as added to and completed by epochal revelation to help eliminate errors and confusions of our conceptions of reality, then over time and as the mortal reality perspective gains factual and objective knowledge and perspective of reality does metaphysics have less and less "empty or blank" canvas which requires our speculation and metaphysical considerations and constructs. In other words, to Andon and Fonta, everything regarding material and spirituality was metaphysical. For us far less is so and in a few hundred or thousand generations, even more will be known and understood about reality. The UB is filled with descriptions of reality not known on our world or not known for a long, long time now, lost in history. Imagine the time to come when our world's view of reality is objectively and commonly held and shared as delivered by the UB and the scientific method has also progressively contributed to our factual understanding of material realities. That which will be subject to metaphysics will be less and less over time. Indeed, on a world in Light & Life, that which is subject to speculation might include primarily those issues of speculation mentioned by the authors of the UB. To me metaphysics is the process of "filling in the blanks" of the unknown and also the unknowable. This process is, according to the UB, a vital and inherent mind function. We have an urge and desire and need and compulsion to "know" and to "understand". Only lazy and indolent minds are indifferent to learning and to knowing. This is one shared commonality and tendency of UB students. You really need to know and understand to dive into this huge volume filled with so much new data and perspective - so much of which challenges and contradicts all prior metaphysics and beliefs! 16:6.4 (191.7) There exists in all personality associations of the cosmic mind a quality which might be denominated the “reality response.” It is this universal cosmic endowment of will creatures which saves them from becoming helpless victims of the implied a priori assumptions of science, philosophy, and religion. This reality sensitivity of the cosmic mind responds to certain phases of reality just as energy-material responds to gravity. It would be still more correct to say that these supermaterial realities so respond to the mind of the cosmos. Me here: It appears to me this is saying that not only does mind respond to reality but also that reality recognizes mind-response and also responds to its recognition??!! We know that all of reality is a creation of mind and must then be mind responsive. Which makes the reality response a symbiotic relationship which denotes a double response. I believe the Supreme is Deity that is similar in function, both cause and effect. The Supreme causes effects and is effected by the mortal experience and both forms of experience contribute to the Supreme Being. 16:6.10 (192.6) In the local universe mind bestowals, these three insights of the cosmic mind constitute the a priori assumptions which make it possible for man to function as a rational and self-conscious personality in the realms of science, philosophy, and religion. Stated otherwise, the recognition of the reality of these three manifestations of the Infinite is by a cosmic technique of self-revelation. Matter-energy is recognized by the mathematical logic of the senses; mind-reason intuitively knows its moral duty; spirit-faith (worship) is the religion of the reality of spiritual experience. These three basic factors in reflective thinking may be unified and co-ordinated in personality development, or they may become disproportionate and virtually unrelated in their respective functions. But when they become unified, they produce a strong character consisting in the correlation of a factual science, a moral philosophy, and a genuine religious experience. And it is these three cosmic intuitions that give objective validity, reality, to man’s experience in and with things, meanings, and values. 16:6.11 (192.7) It is the purpose of education to develop and sharpen these innate endowments of the human mind; of civilization to express them; of life experience to realize them; of religion to ennoble them; and of personality to unify them. Self Revelation....a new concept for me I don't recall from all prior readings. Revelation of reality that is a function of our innate endowment of mind and the cosmic intuitions ....the ability to figure stuff out by reason, intuition, inspiration, and insight....and for those to function, metaphysics is a tool and function which assists that process of learning and knowing. Or so I understand. 3 forms of revelation - self revelation by thought and mind endowment; personal/auto revelation by the Thought Adjusters; and Epochal Revelation. That is excellent analysis, except I would exonorate what we consider "the nature of metaphysics" or as "metaphysics per se", does not require mortal mind's attempt to explain and understand in order to have relevent present-actuality-status for the human individual. The existence of Andon and Fonta, for Urantia as for every evolutionary world, signifies the "birth of morontial beings". And therefore, it is indeed metaphysically significant. Metaphysics pertaining to the inner mechanism of man which enables Revelation to enter into the conscious streams of human thought. Of course this is an esoteric subject, which personality would perhaps not divulge to a maturing sphere, sociologically or intellectually. Even as a human embryo is considered a parasite before it is considered an infant or child, the morontial form is likened unto "being in its embryonic stage while sojourning in the material tabernacle upon Urantia." Then in fact, with metaphysics one must approach God through the prospect that I am a parasite of the cosmic mind? No, I don't consider the relationship parasitic by any definition of the word nor by UB description nor by my own prior metaphysics or speculation. Mortal mind is a creation of Deity and is coordinated and integral to Cosmic Mind and part of the Divine circuitry of reflectivity and is endowed as a gift along with personality....we are part of an integrated whole and there is nothing in reality that is or can be parasitic rather that systemic I do not think. And how about the mortal/tadpoles' contributions to the Supreme and our contributions to both service and new universe potential? A false claim IMO...and an inaccurate and further portrayal of your gloomy view of the wondrous, glorious reality presented in the UB where mortals are creative contributors of reality potentials and actualizations. Thanks for the compliment. Unfortunately I must point out several declarations in your response which contradict the UB and/or confuse terms to the detriment of discussion and agreement... For example I do not think "exonerate" means what you think it might. And you may claim that "the nature of metaphysics" or as "metaphysics per se", does not require mortal mind's attempt to explain and understand in order to have relevent present-actuality-status for the human individual." ...but you would be incorrect. Metaphysics is, by definition, the mind's attempt to explain and understand that which is not currently understood or explained factually. It is the only thing that makes metaphysics relevant at all to anything....that is its purpose and its definition. The existence of Andon and Fonta on every evolutionary world is the crowing achievement of the Life Carrier and Adjutants which signifies the birth of mortal beings or people or humans (not yet morontial beings but potentially morontial only) who have the potential for soul (or morontia mind within an evolutionary/mortal being). When the first such human is registered a world is deemed inhabited for the first time and begins its inevitable and epochal evolution to a world settled in Light and Life. The difference in your claim and the facts presented in the UB are significant and notable SEla. 62:7.7 (710.6) It is just 993,408 years ago (from the year A.D. 1934) that Urantia was formally recognized as a planet of human habitation in the universe of Nebadon. Biologic evolution had once again achieved the human levels of will dignity; man had arrived on planet 606 of Satania. The phrase "metaphysically significant" would indicate that you still do not understand the meaning of the word metaphysical as used in the UB and defined in any dictionary. Again, let me reiterate that those facts provided by science which are indeed factual and those cited in the UB are not metaphysical and cannot be metaphysically significant. Metaphysics are not facts known or revealed....metaphysics are suppositions, speculations, deductions, inductions, and theories designed to substitute for facts until facts become available and known. Perhaps it would be helpful if you would become familiar with and accept the actual definitions and terminology used and shared here? The mechanism which enables "Revelation to enter into the conscious streams of human thought" is well presented in the UB as the Thought Adjuster, the Cosmic Mind, and the reality response combined with logic, reason, insight, intuition, and the affirmations by the Spirit of Truth. This again is not metaphysical as revealed to us factually and described in the UB. I've already posted my objection to and disagreement with the parasitic proposition you present above. Please consider the value of posting text in such discussions. Thank you. But man's attempt to capitulate intellectually the nature of Revelation, or the function of autorevelation, through the actual mechanics of metaphysics, will "come up short" in the final analysis? Even if one is "properly processing" the truth of Revelation for one's own purposes and inner-striving, even if one is properly attuned? The mechanics of metaphysics need not be explained but rather "geared into" the doing of God's will, whence such mechanism of supernal potential becomes activated in the sentience of the human individual? How is the harmony of the universe revealed to the mind of a human individual, through the establishment of a central unity after the person has adopted the standard of finality and eternity, where all future action is predicated upon the goal of likeness unto God. 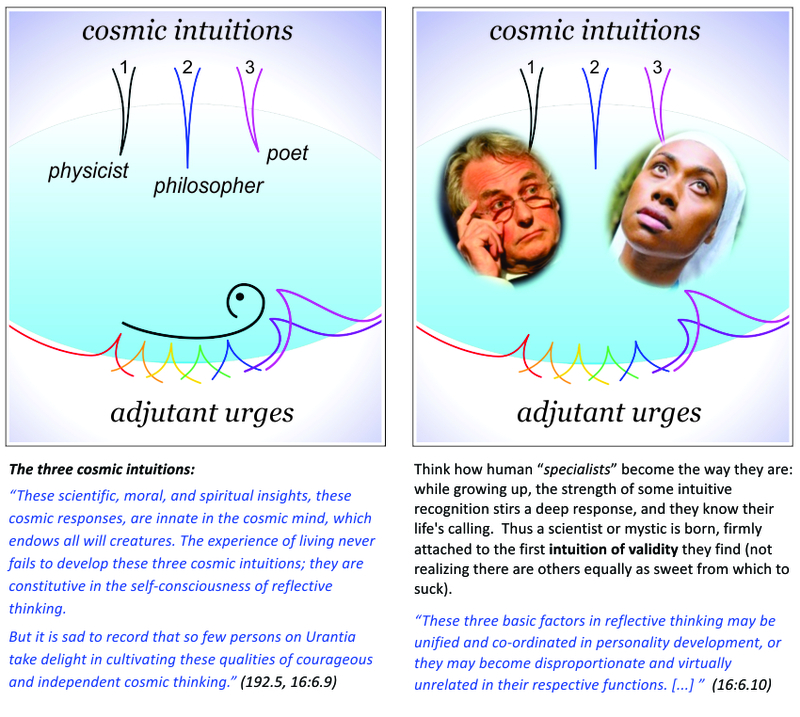 In the Urantia Papers, ascencion is foreshadowed upon entrance into the central universe, whereas it is also likened unto a quest of personality attainment. What do you mean by "capitulate intellectually"? By the "mechanics of metaphysics" do you mean imagination, speculation, reason, intuition, insight, etc.? Aren't these the mechanics or functional aspects of metaphysics? Please make a distinction between the facts of epochal revelation and the truths of personal/auto revelation....and yes all truth is relative to the maturity, experience, wisdom, and education of the individual and truth will adjust and refine by all of those over time. So far as I can tell from the UB no persons will ever have adopted "the standard of finality and eternity" in this life or the morontia life to come and only by the purification of motive upon our Finality do we even begin to approach "the goal of likeness unto God". The process of such perfecting requires eternity to progress in such an objective. And ascension begins with the birth of soul and is, by definition, every level of Circle Progress and universe education and experience between birth of soul and Finality so it is certainly not "foreshadowed by entrance into the central universe". And personality is attained at mortal birth...it is not a quest at all...spiritization and fusion and finality are all quests however FOR the personality attained at birth!!! Again....declarations of personal inventions and fictions of pure ego imposed upon this study group and this topic!! Do you not understand the topic Stephen?? It's not about your metaphysics or my metaphysics....it is about the subject of metaphysics and how that is presented in the Revelation. Where's Pete and his brother Repeat????!!!! When is enough enough?? A study of human metaphysics, its definition and purpose and value to our ascension and transformative progress in this life, requires consideration and examination of many different but related concepts, including philosophy, religion, science, self revelation, personal revelation, epochal revelation, theology, materialism, spirit, and our dual nature as mortal beings....and more! The mortal being is designed and created for all of these inter-related experiences; just like the material body is designed for eating, sleeping, motion, material manipulation, walking, talking, procreation, and all those inter-related experiences. The mind is the vehicle for the first of our dual natures and the body is the vehicle for the second. Both sets of systems are inter-dependent on all the inter-related elements to form a functional and cohesive integration of being...and becoming. So far in this study, my understanding can be summarized as: metaphysics is the earlier and less accurate formation of ideas and beliefs about how the inner world of religious experience relates to the material world - awareness of self and the other-within interacting with the world of physics and materialism. This construction of fictional and mythical beliefs is built by self and personal revelation, and by reason, observation, speculation, and a host of unsubstantiated assumptions. When I say earlier, I don't mean that we outgrow metaphysics but only that less and less of our reality-construct is false or fictional and based on metaphysics (again, that which is factual and known as such is not metaphysical) as science, experience (material and religious), truth, wisdom, assurance, confirmation, and other forms of actualization (or factualization) reduce those fictions and unknowns in both quantity and over time. Our mind creates solutions and beliefs to bear the weight of our examination and experience of the totality of the reality that the mind can conceive. As examination and experience reveals the true nature of reality, there is less for metaphysics to invent and construct and philosophy begins to grow as it unifies and harmonizes the material and spiritual realities and natures based on examination and experience and the wisdom that comes thereby. Without factual science and epochal revelation and religious experiential wisdom, metaphysics remains an important and functional tool for the speculative completion of universe reality. As the authors of the Papers demonstrate and teach (both), much about universe reality remains subject to speculation even beyond the mortal experience on our world of birth...and even with mota. Observation, reason, insight, inspiration, and revelation are very experiential contributions to metaphysics, philosophy, science, and theology. Please note below, again, how irrelevant facts and truth are to religious experience and progress!! Metaphysics and theology may be based on total fiction and false beliefs and yet faith and growth may still result in meaningful, even powerful ways. Fact and perspective of universe reality are important and our destiny always provides those over time...but not always (or often?) in this material life of origin. This is the definition of Agondonter...those who grow in faith despite ignorance and falsehoods!! Fascinating! 103:6.1 (1135.3) Theology is the study of the actions and reactions of the human spirit; it can never become a science since it must always be combined more or less with psychology in its personal expression and with philosophy in its systematic portrayal. Theology is always the study of your religion; the study of another’s religion is psychology. 103:6.2 (1135.4) When man approaches the study and examination of his universe from the outside, he brings into being the various physical sciences; when he approaches the research of himself and the universe from the inside, he gives origin to theology and metaphysics. The later art of philosophy develops in an effort to harmonize the many discrepancies which are destined at first to appear between the findings and teachings of these two diametrically opposite avenues of approaching the universe of things and beings. 103:9.6 (1141.4) When theology masters religion, religion dies; it becomes a doctrine instead of a life. The mission of theology is merely to facilitate the self-consciousness of personal spiritual experience. Theology constitutes the religious effort to define, clarify, expound, and justify the experiential claims of religion, which, in the last analysis, can be validated only by living faith. In the higher philosophy of the universe, wisdom, like reason, becomes allied to faith. Reason, wisdom, and faith are man’s highest human attainments. Reason introduces man to the world of facts, to things; wisdom introduces him to a world of truth, to relationships; faith initiates him into a world of divinity, spiritual experience. Me here: So much to learn! we can progress beyond the metaphysical attempts at developing a balanced two-dimensional philosophy and develop the unified, well-balanced 3-d religious philosophy presented in the papers...right now. Of course that depends on our Circle Progress and experiential wisdom. The presentation in the Papers is the additive of both revealed truths and facts by Epochal Revelation to enhance the more objective and mature perspective of universe reality...materially, spiritually, and especially with the addition of the morontial realities in between...reducing mortal confusions and eliminating mortal errors of perception, assumption, and conclusion. You disagree with my attempt to agree with you? You said "we can progress beyond the metaphysical attempts at developing a balanced two-dimensional philosophy and develop the unified, well-balanced 3-d religious philosophy presented in the papers...right now." I agree with you....and I agreed originally....depending on circle progress and experiential wisdom - when that is or becomes sufficient to understand and accept what's presented in the Papers and to move beyond our own limitations and myopic perspective and preconceived beliefs, then we can "develop the unified, well-balanced 3-d religious philosophy presented in the papers...right now." I will try to find supporting quotes for my understanding of the teachings that as we progress in the Spirit and in the knowledge of reality we gain objectivity and a more unified and multi-dimensional perspective of reality (circle progress) moving "beyond the metaphysical attempts at developing a balanced two-dimensional philosophy". Always happy to verify concepts and opinions with text...or adjust those accordingly. Thanks for asking! well you didn't agree with me because adopting right now and developing the philosophy in the papers doesn't depend on any cosmic circle progress...it's understandable and attainable to all except the abnormal mind. nor does such a unified philosophy depend on studying the papers. it can, and does, come thru personal revelations and the bookstores are full of minds from all three fields attempting to do just that, with more or less success. I appreciate this opportunity to dig further into the functionality of metaphysics and how that is related to philosophy, science, faith, belief, and spiritual progress!! Thanks again Makalu for asking for clarification! So....why would we and how do we release our own beliefs and perspective of universe realities for more factual and meaningful and experiential perspective? How do we move from what Makalu calls a two dimensional perspective to a 3 dimensional view of universe reality? Certainly one way is to abandon or enrich our more limited and humanistic and inexperienced perspective with that provided by the authors of the Papers...as Makalu proposes above! Personally, I could not do this directly and automatically simply by reading the Papers...my own mind was more reluctant and perhaps skeptical. But eventually that is just what I did....I chose to replace lots of my own metaphysics, slowly and one piece or belief and concept at a time as I read and studied and re-read and studied even more these Papers which deliver such a detailed and integrated portrait of universe reality. What a gift. We are told the very purpose of this gift is to reduce confusions and eliminate metaphysical errors to bring clarity and new dimension to our view and lens of reality. 110:6.16 (1211.1) Perhaps these psychic circles of mortal progression would be better denominated cosmic levels—actual meaning grasps and value realizations of progressive approach to the morontia consciousness of initial relationship of the evolutionary soul with the emerging Supreme Being. And it is this very relationship that makes it forever impossible fully to explain the significance of the cosmic circles to the material mind. These circle attainments are only relatively related to God-consciousness. A seventh or sixth circler can be almost as truly God-knowing—sonship conscious—as a second or first circler, but such lower circle beings are far less conscious of experiential relation to the Supreme Being, universe citizenship. The attainment of these cosmic circles will become a part of the ascenders’ experience on the mansion worlds if they fail of such achievement before natural death. 110:6.18 (1211.3) The mastery of the cosmic circles is related to the quantitative growth of the morontia soul, the comprehension of supreme meanings. But the qualitative status of this immortal soul is wholly dependent on the grasp of living faith upon the Paradise-potential fact-value that mortal man is a son of the eternal God. Therefore does a seventh circler go on to the mansion worlds to attain further quantitative realization of cosmic growth just as does a second or even a first circler. 110:6.19 (1211.4) There is only an indirect relation between cosmic-circle attainment and actual spiritual religious experience; such attainments are reciprocal and therefore mutually beneficial. Purely spiritual development may have little to do with planetary material prosperity, but circle attainment always augments the potential of human success and mortal achievement. 110:6.20 (1211.5) From the seventh to the third circle there occurs increased and unified action of the seven adjutant mind-spirits in the task of weaning the mortal mind from its dependence on the realities of the material life mechanisms preparatory to increased introduction to morontia levels of experience. From the third circle onward the adjutant influence progressively diminishes. 110:6.21 (1211.6) The seven circles embrace mortal experience extending from the highest purely animal level to the lowest actual contactual morontia level of self-consciousness as a personality experience. The mastery of the first cosmic circle signalizes the attainment of premorontia mortal maturity and marks the termination of the conjoint ministry of the adjutant mind-spirits as an exclusive influence of mind action in the human personality. Beyond the first circle, mind becomes increasingly akin to the intelligence of the morontia stage of evolution, the conjoined ministry of the cosmic mind and the superadjutant endowment of the Creative Spirit of a local universe. Me here: so that's my reason for my claim above. I am happy to consider more ideas and further text in support of or to refute that claim.